Ernesto Rodrigues / violin, viola, soprano saxophone. Guilherme Rodrigues / cello. José Oliveira / percussion, acoustic guitar. 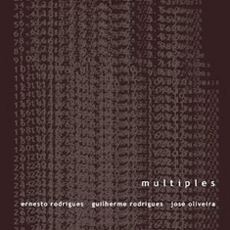 The Portuguese string trio of Ernesto Rodrigues, Guilherme Rodrigues and José Oliveira reconfigures itself into a reed/string trio or a string percussion trio or variations thereon during the course of their 28 vignettes, and the result is music that is always stimulating and unpredictable. Their program is totally unstructured and spontaneous, and the wealth of sounds they develop carries it into the outer reaches of sonic development. It has touches of modern classical at its roots (or as suggested in the liner notes “false chamber music”), but it is imaginative and improvised music created in the moment through the close interaction of the three. Ernesto Rodrigues primarily plays the violin or viola, but he also adopts the soprano saxophone to ignite a spark of a different degree of intensity. José Oliveira plays acoustic guitar and also fills in the cracks and crevices with freelance percussion, focusing on chimes, rattles, and bell tones. Guilherme Rodrigues remains with the cello throughout, giving a solidifying base to their output. The instrumental variations color the set with significantly different hues. With violin, cello and percussion as a central alignment, eeriness abounds. José Oliveira often approaches the guitar as a percussion instrument, and his slapping techniques bode well with the steamy vibrations of the surrounding strings. The segments with soprano saxophone add a further, often more robust dimension to the sound possibilities. The music is not spatial. It has connectivity, flow, and consistency even though the tones at times border on the minimal. Screechy filaments from the strings often dot the mini-tunes, as do reverberant clanging and rubbing noises. When the cello, violin and guitar are blazing away, the emotional level is at a peak.